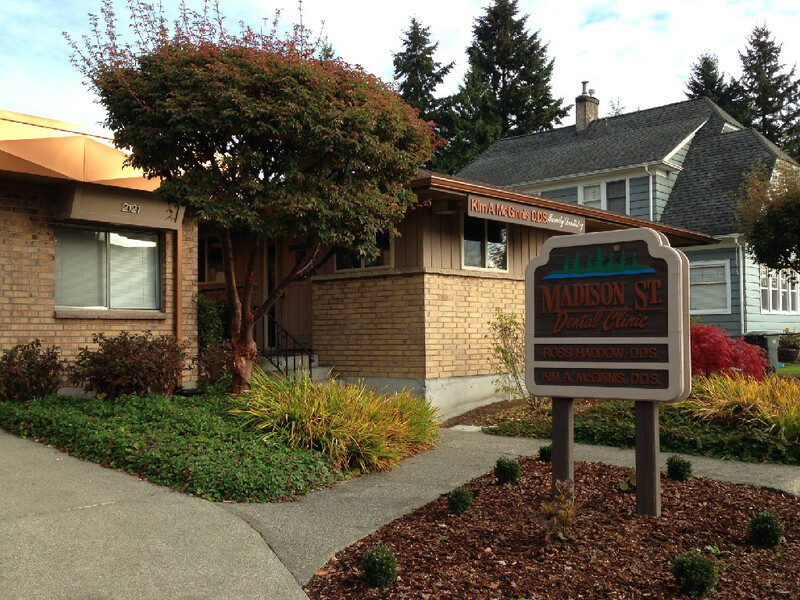 Here at the dental office of Kim A McGinnis, we strive to provide friendly, comfortable dental services for Everett families. We take pride in providing complete dental care, but occasionally there are situations that arise where specialized treatment is required. We maintain an excellent relationship with “Specialists” in the area that offer Orthodontics, Periodontics, Root Canal Therapy and advanced Oral Surgery services. If for some reason we are not able to provide care for you here in our office, we will be happy to assist you in making any appointments you may need at a specialist best suited to your needs. As we strive to offer new technology to our patients, we have recently upgraded our entire dental network to include digital dental x-rays and charting software! 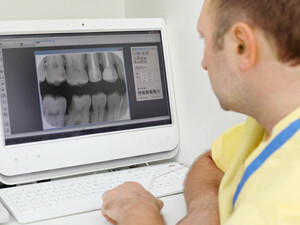 With digital dental x-rays we are able to see and do so much more radiographically for our patients. Given the ability to enhance the images we are able to involve patients more in the treatment process. We are able to offer a great reduction in the exposure to radiation for our patients! Brush at least twice a day. Use a soft-bristled toothbrush and fluoride toothpaste to remove food particles and plaque from the tooth surfaces. Include the top surface of your tongue as this will remove food particles and bacteria to help freshen your breath! Floss at least once a day. Use of a mouthwash to help kill bacteria and freshen your breath. Decay-causing bacteria hide between teeth where toothbrush bristles can’t reach. Floss and mouthwash will help remove plaque and food particles from between the teeth and under the gum line. Avoid sugary foods and treats. Nutritious foods can help keep your smile healthy. Regular checkups with your dentist every six months for a professional teeth cleaning. Ask about dental sealants, protective plastic coatings that can be applied to the chewing surfaces of the back teeth where decay often starts. The information gathered will assist Dr. McGinnis in gaining an overall sense of your current oral health. You and Dr. McGinnis will be able to discuss any areas that need attention or restoration, any areas that are personally or cosmetically concerning to you and also be able to come up with an overall plan on how to proceed. We recommend our patients return every 6 months for their regular re-care visits in order to keep maintain good dental health and appraise any areas concerns that may arise. We offer a range of restorative care from basic white or silver fillings, crowns and bridges, removable appliance fabrication (dentures and partials) and restoration of dental implants. Traditional dental filling materials include gold, silver amalgam, porcelain, and composite. The strength and durability of dental materials make them useful for restoring teeth that must withstand the extreme forces that occur during chewing. The newer dental filling materials include ceramic and plastic materials that appear tooth like in color. These dental materials, often called composite resins, are mainly used on the front teeth where a natural appearance is paramount, but they are also used on the back teeth. These newer tooth colored dental materials are now being used as a replacement for, or instead of, the old “Silver Amalgam” fillings that many people have. This use in the back teeth depends on how big the tooth decay is and the location. 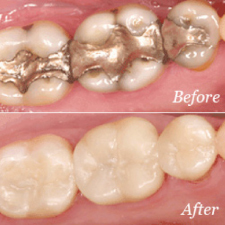 Very larger fillings are still better served using silver amalgam versus composite resins, though the durability of the composite materials are getting closer that of the silver amalgam durability with each new generation of dental material. Before your fillings treatment begins, Dr. McGinnis will discuss your options and help you choose the best dental filling material for your particular needs. Crowns are a cosmetic restoration for a tooth that requires a restoration larger than a filling, most often used for teeth that are broken, worn, have had a root canal, or are partially destroyed by tooth decay. Crowns are needed when there is insufficient tooth structure or tooth strength to support or hold a filling. Crowns are “cemented” onto your existing tooth covering the entire tooth above the gum line. Since a Crown covers an entire tooth, further breakage of the tooth is reduced. Unlike fillings which are directly applied in your mouth, crowns are fabricated in a dental lab from a master impression of your tooth and returned to be “cemented” onto your tooth. Crowns can be made of many materials such as porcelain, metal, a combination of both, or the newer non-porcelain non-metal tooth colored materials that mimic the natural appearance of your teeth. Bridges are a group of crowns connected together and used as a permanent restoration to replace a missing tooth or teeth. This provides the patient with a permanently cemented appliance that returns the proper function to the dentition and completes the smile. They are recommended when a tooth is missing or is required to be extracted. Bridges can be made with many combinations of gold, alloys, and porcelain. 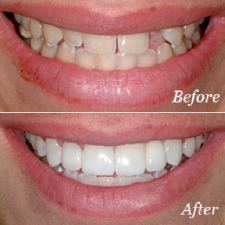 Newer tooth like materials that are non-porcelain and non-metal can also be used. Bridge success largely depends upon the base it is built upon including the gums and bone support of the teeth the bridge is cemented to. Crowns and bridges usually require 2 appointments. Root canals are usually required when a tooth has a cavity that has compromised the nerve, or if a tooth fractures and the nerve becomes exposed. The exposed or compromised nerve will lead to a dental infection. The root canal procedures goal is to remove the infection causing nerve material and return the tooth to good health. Once the root canal is done, the tooth needs to be restored with either a basic filling or a crown depending on how much of the tooth is left. Over the years, the technology of the root canal procedure has changed into a very high tech procedure, requiring a Specialist for optimal results. Dentures can provide function for the patient who has or is about to lose many if not all of their permanent teeth. We provide complete construction of Full Dentures or Partial Dentures. Smiles were meant for a lifetime, but sometimes teeth are lost. Dental Implants are an alternative way to replacing missing teeth without the need of a bridge or even dentures. If you’ve lost a tooth (or a few teeth) due to injury or disease, dental implants can rejuvenate both your smile and your oral health. A dental implant is a synthetic tooth root made of titanium in the shape of a post that is surgically placed into the jawbone. The Titanium material used is a metal that is well-suited to integrating with human bone. A replacement tooth is then attached to the post. The tooth or teeth will be either permanently attached or removable. Permanent teeth are more stable and feel more like natural teeth. To be a candidate for dental implants, a sufficient amount of bone in the jaw must be present with healthy gums and no sign of gum disease. 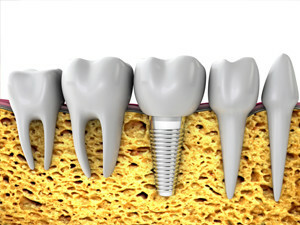 Implants can be used to replace single missing teeth or multiple missing teeth. If you are missing 2 or more teeth in a row, 2 implants can have a bridge placed on top of the implants. Also, dentures can be constructed over a few well-placed implants, improving the overall stability and function of the denture. Many times the implants under the denture make the difference between a patient using the denture or not being able to use the denture. Bridges, because they rely on the teeth on either side of the missing tooth for support, compromise the health of your natural teeth. Most bridges have a 10 year or less lifespan. 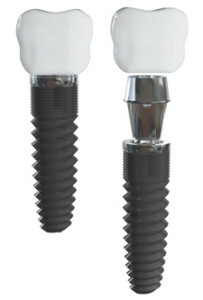 Dental Implants are anchored in bone for support and do not compromise the health of the surrounding teeth. Conventional dentures are not anchored to the bone, and can therefore be unstable. This can make it difficult to eat or smile with confidence. Implants can stabilize a denture, making it act more like normal teeth, with a stronger biting force. Having the need for a tooth extraction can be a daunting experience; luckily for our patients, Dr. McGinnis and our assistants understand this and are very patient and thorough. In most cases, we can perform simple tooth extractions here in our office, but if for some reason the tooth needs some extra finesse, we have a great group of Oral Surgeons that we refer to for the removal of difficult teeth.